That's the year when parts of the International Space Station could be ready to be sent to an asteroid. 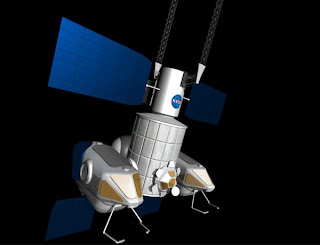 NASA has this week held a conference to decide what to do with the $100 billion station after it retires in 2020 and, after Barack Obama's pledge to send astronauts to an asteroid by 2025, it seems a bit of recycling may be in order. One suggestion for the retired space station is that one of its compartments, called Tranquility, could be attached to a pair of spacecraft capable of landing on the an asteroid. Another option being discussed is the idea of creating a large centrifuge type structure in order to achieve some form of artificial gravity in space. This may prevent bone and muscle loss in astronauts experiencing zero gravity. A (pdf) summary of the options as outlined by NASA at the conference is available here.